A dog lost for 12 days after an interstate crash was found early Monday morning by a fisherman who initially thought the rust-colored Hungarian pointer was a fox. "It was like losing a family member," he said. 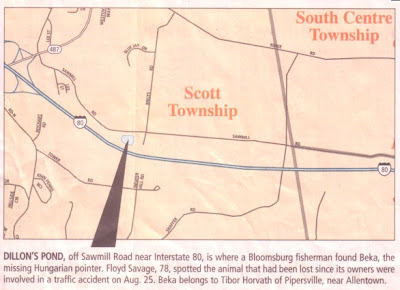 Beka had run away from Horvath's Chevrolet Tahoe after it crashed on Interstate 80 between the Lime Ridge and Lightstreet exits on Aug. 25. Searches in a rented plane and helicopter shortly after the crash turned up no traces of the pet. Horvath and his 24-year-old son, Justin, had come to the area Saturday looking for Beka. They concentrated their search on Sawmill Road, but hadn't seen anything. After an article about the lost dog was printed in the paper Sunday, Horvath said he received a number of tips about where the pet might have been. He went to Berwick following one lead Sunday. On Monday morning, he had taken a trip to Orangeville on another. But neither panned out. Then Floyd Savage, 78, of West Fourth Street, Bloomsburg, decided to go fishing Monday morning at his usual fishing hole, Dillon's Pond. The pond is located off Sawmill Road opposite the PPL offices, right next to Interstate 80. The site is about seven-tenths of a mile from the Lightstreet exit. 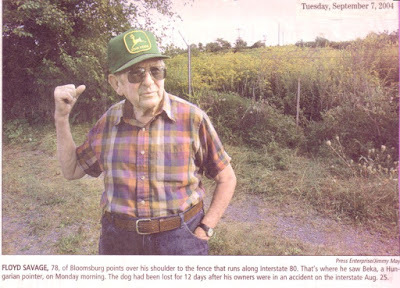 As Savage was fixing his hook on his line around 7:30 a.m., he said he saw a rustling in the field of 6-foot-high goldenrod on the other side of the deer fence that separates the pond from I-80. Then he saw something red. "I thought it was a fox or maybe a deer," Savage said. So he went fishing for a while, catching three bass and two blue gill and throwing them back. When he was done, he came back up to his car and saw the animal again, Savage said. As he got closer, he saw it was a dog. He went over to the fence to see if he could let it underneath, but Savage said it started growling at him. So he left it alone and went home. When Savage was telling his daughter, Beverly Hunsinger, about the animal, she said she thought right away about the article she had read in the paper on Sunday. "I told him, `I bet it was that dog,"' she said. 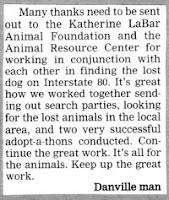 So she called an Animal Resource Center volunteer she knew, and also state dog warden Jim Dent. A volunteer from the animal center then contacted Horvath, who hurried down to the pond. When they arrived around 10:30 a.m., Horvath said his son, Justin, went about 50 yards east from where Savage had seen the dog and started calling Beka's name. Within four minutes, he lifted the fence and yelled, "l found him! ", Hunsinger said. Horvath had trouble talking about the moment he found the dog when reached later in the day. "I get all choked up." The dog was less than a mile and a half from where his Tahoe had spun out, Horvath said. Beka had beaten down path: in the tall weeds and "made himself a nest," Horvath said. It appeared he had been able to get a little water from puddle, said the pet's owner. The weeds were so tall, there was no way the dog could have been seen from the air, Savage said. Horvath said he's been giving the dog a lot of water to get him rehydrated. He gave the dog a can of food right after he was found, and was slowly feeding him bland food like turkey and rice. Beka was a strong, healthy dog before the accident, Horvath said. It may take a while to get the dog back in shape, he said. In the meantime, Horvath said he wanted to thank Columbia County for the support it gave to his family. By Sunday afternoon in Berwick, people were already saying to him, "Oh, you're that family that lost the dog," Horvath said. "Everyone was so helpful." Horvath said he planned to give out two $500 rewards, one to Savage and one to Gina Geiser of Berwick, who called Monday morning to say she thought she had seen the dog near the Lightstreet exit Sunday around noon. He also wanted to thank the Animal Resource Center for putting together a search party for Beka. He said he was also going to send the planned no-kill animal shelter a donation. Peter Kendron covers the Town of Bloomsburg and Bloomsburg University. Call him at 387-1234, ext. 1312, or e- mail him at kendron@pressenterprise.net. TIBOR HORVATH, kneeling at left, holds Beka, his Hungarian pointer, after the dog was found Monday. 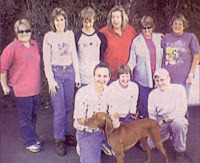 Around him are volunteers with the Animal Resource Center who helped in the search. This photo was taken with a cellular telephone.